The Cheltenham Festival and the Grand National, two of the biggest horse racing events of the year, are slowly approaching. Bookmakers Paddy Power are already allowing punters to bet on the Cheltenham races. Both events are known worldwide but especially the Grand National which is the finale of the Aintree Festival which takes place over 3 days during the first week in April. The Australian’s Melbourne Cup is known as the race that stops a nation but arguably the Grand National is the race that stops the world. The race is one of the most strenuous and taxing held anywhere with the exception perhaps of the Velka Pardubicka steeplechase held in the Czech Republic. The Grand National is a handicap steeplechase run over 4 miles 514 yards and horses jump a total of 30 brush fences. 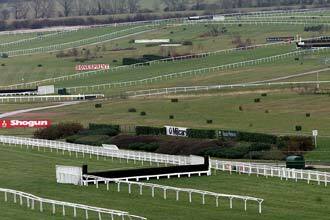 Most of these huge fences have names of which the most well known are Becher’s Brook, The Chair and the Canal Turn. It is the most valuable jumps race held in Europe with a prize fund of £1m in 2016. The most famous horse to win the race was Red Rum who was unique in winning the race on three occasions, 1973, 1974, 1977. He was trained by Ginger McCain and owned by Noel Le Mare and held the course record of 9 minutes 1.9 seconds for 16 years. 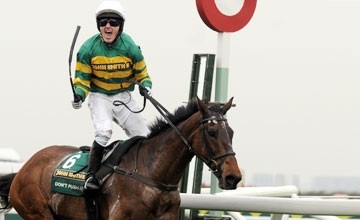 The most famous jockey to almost never win the race was Sir Tony McCoy, Champion jumps jockey in the UK for 20 consecutive years. However he finally got the monkey off his back in 2010 when he rode Don’t Push It to victory. The four day National Hunt meeting is held annually every March at the Prestbury Park Racecourse in Cheltenham, Glos. UK. It forms the climax of the National Hunt season and is especially popular with the Irish who send over a large contingent of their horses to compete in a number of valuable races. The most prestigious of these is the Cheltenham Gold Cup. This is a Grade 1 race over 3 miles 2 ½ furlongs, with 22 fences and a prize in 2017 of £327,463 to the winner. Among the most famous horses to win the race are Arkle, Best Mate, Golden Miller and Kauto Star. The latter won the race twice in 2007 and 2009, becoming the first horse to regain the crown after losing it in 2008 to stablemate Denman.